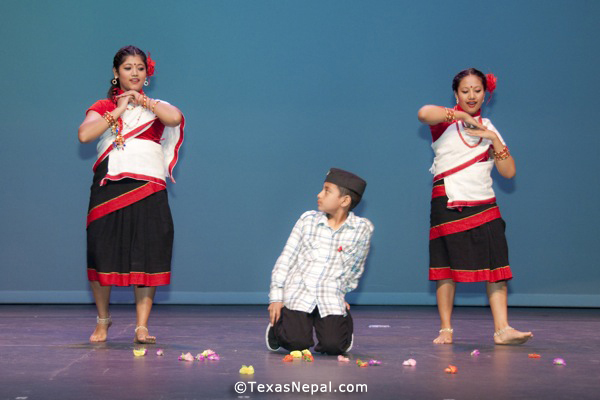 Nepalese Society, Texas (NST) organized an event to celebrate the biggest Nepali festival, Dashain, amidst various cultural programs along with celebration of its 12th year of establishment on Sunday, October 10, 2010 at Irving Arts Center with participation of a huge crowd of around 700 people. The event began with distributing certificates of appreciation to the founding members of NST along with other volunteers who have been part of NST’s activities. Then followed the cultural program with performances by popular Nepali artists like Sapana Shree, Yam Baral, Narayan Tripathi along with various local talents, dancing in traditional Nepali songs. The event was ended with drawing of the NST fund raising raffle. According to NST’s website, any unclaimed prize can be claimed from NST’s office located at 940 N. Belt line Rd#129, Irving, TX 75061 by November 10, 2010 with the raffle stub. You can also contact the NST President Dr. Prem Adhikari at 940-594-8910 for any questions related to the raffle, the event or NST in general. hi guys great job. i have a question i saw one of my fren dancing on the program. is it possible to get her picture. i tried to download but couldn’t download the full size format of pictures. so please let me know from where i can get the pictures. Click on the photo’s thumbnail to enlarge it and then right click to choose “Save Image”.